Another great idea for snack that won’t affect your sugar levels too much. I love these thin and crispy crackers topped with creamy cheese or slice of salami. I recommend doubling the recipe and saving some for later. You can store them in a biscuit tin or air-tight container (not sure for how long as mine always disappear quite quickly!). 2. In a medium bowl mix all the ingredients and leave to stand for about 10 minutes. Form a big ball with the dough. 3. Place the dough ball between 2 parchment paper sheets and roll it until quite thin (I like mine no thicker than 1/2 centimetre). 4. Remove the top sheet of the paper and cut the dough in squares. 5. Transfer the sheet with dough on the baking tray and bake for about 20 min. If you like your crackers crispy turn off the oven and leave them in there for an hour or so. Thanks Ewelina. 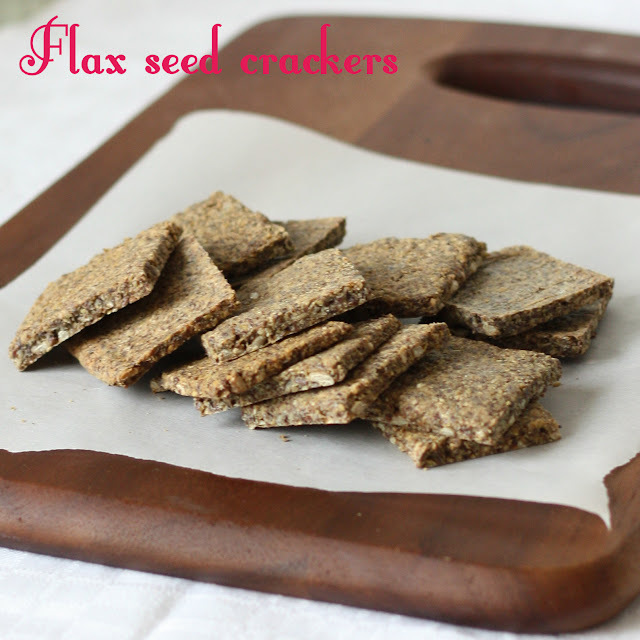 I was inspired by this recipe, but didn't have the most ingredients (flax seeds, sunflower seeds, parmesan). I made mine with golden linseeds, pumpkin seeds, mature cheddar, lime zest and chillies. I don't think I will ever buy crackers again. Delicious, very low carb, easy to make and flavours are unlimited. Thanks for inspiration. You're doing a great job. Typically, I would use a cup of water for each 3-4 tablespoons of whole flax seeds, which will give you a good texture at the end of it. This ground flax seed mix is perfect for your shakes or mixed into cereal. Alternatively, you can blend your smoothie directly together with your flax seed for a tasty and healthy treat.